Inspired by the lovely painting "Go For a Swim" by Jennifer Mercede. Today I spoke with my class about the parts of a sea turtle and how the front flippers are different from the back. We looked at photos of turtles and noticed the different sizes of circles that make up the segments on the body (large for the shell, medium for legs, small for head). We used purple-toned oil pastels to outline the body and shell segments, then colored in scribbles of yellow, orange, and pink tones inside the circles. We also used yellow oil pastels to make a "wiggly grid" in the ocean water to give the water movement. I spoke about the sunlight filtering through the water makes colorful reflections on the turtle. 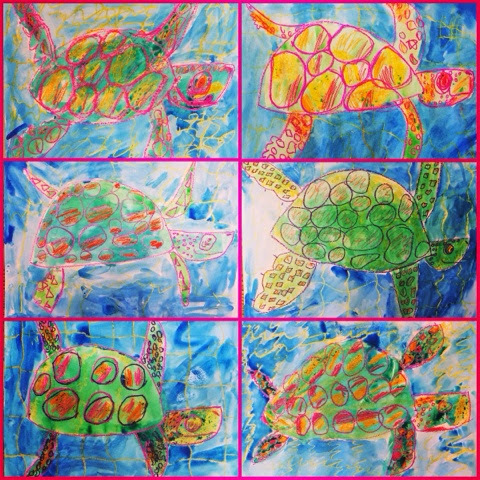 We used green and teal watercolors for the turtle's body and blue for the ocean water. I just love how colorful they are!